Father’s Day will be here before you know it, and what better way to help celebrate the love of your life – then with something handmade by you! 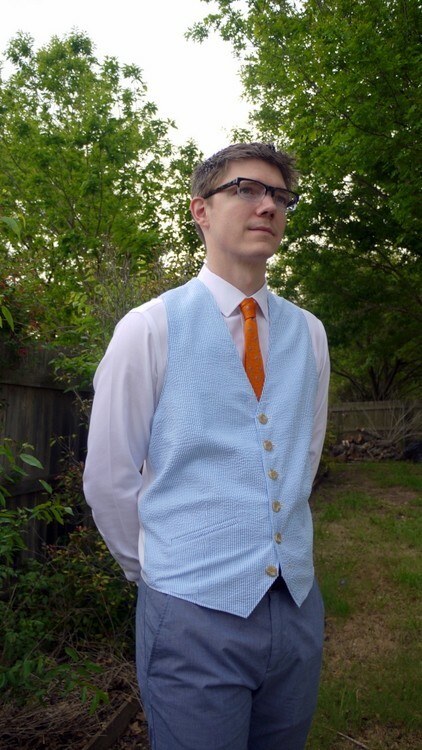 Melissa of the Sewing Rabbit Team is here showing you how to sew a men’s vest with this easy sewing tutorial! 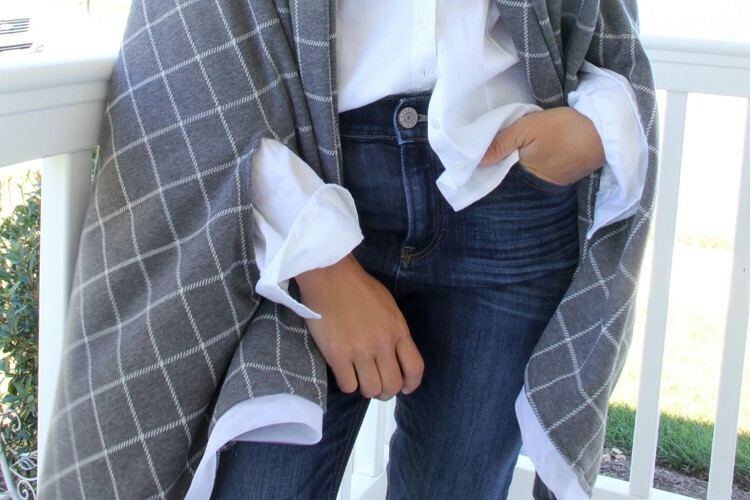 Perfect for dressing up, holidays, weddings, and even work attire! We don’t sew enough for the men in our lives. Which is why I really love this DIY, celebrating the men. Melissa rocks. I don’t sew much for myself, let alone for my man. Aside from the occasional necktie and hemming his pants, I haven’t really attempted to make him anything. He has to wear a shirt & tie to work everyday, so I thought I’d make another piece to spruce up his options. Springtime = Seersucker! 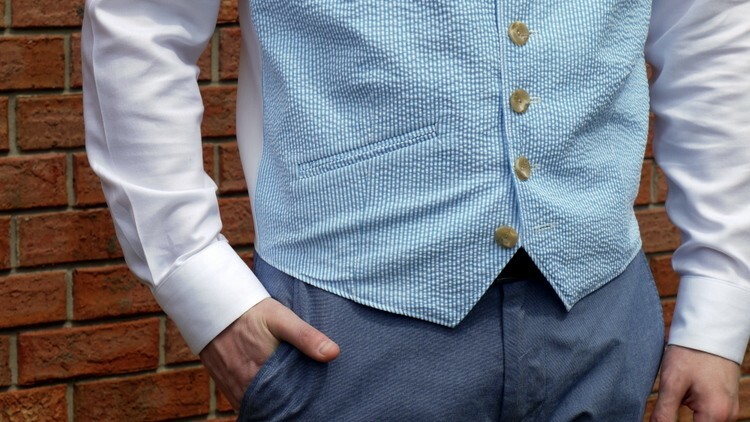 Here’s how to draft an easy vest from one your man (or yourself) already owns. 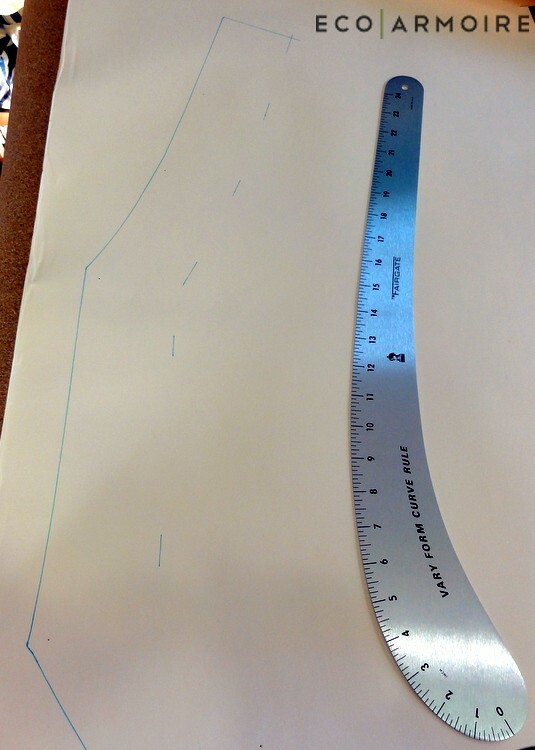 Draw a squared line on your pattern paper. Position the center front along the vertical line. Pin in place. Trace the bottom hem, stopping at the dart. Make a little dot or perpendicular line to mark the first dart leg intersection. Using the same dart moving technique that I outlined in the Chambray Top tutorial I made last month, measure the dart intake and shift the dart leg over, pivoting around the pinned dart tip. You’ll need to remove the original pins on the center front to swing the dart leg over. Be sure to measure your dart legs and make sure they are even. 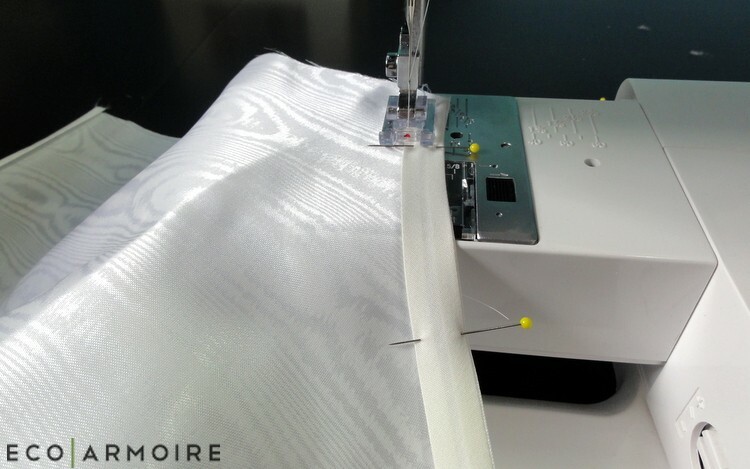 Then, finish drawing the rest of the hem line towards the side seam. 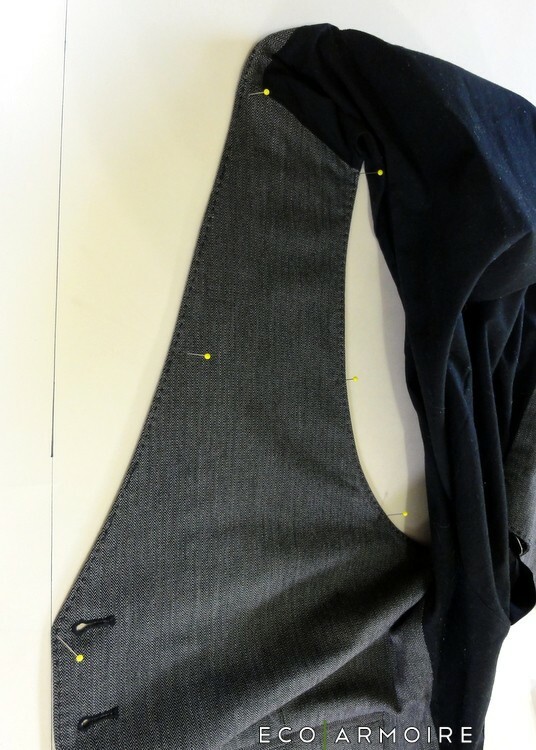 Mark the side seam point with small dash. Mark your buttonholes. 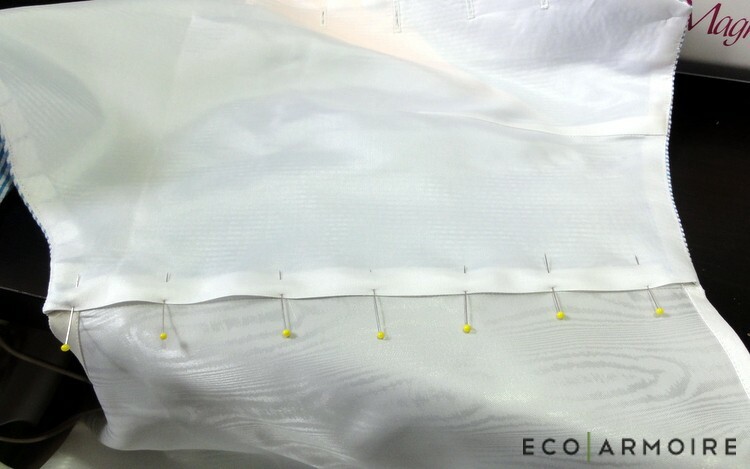 Then, pin neck line and armhole; you’ll need to remove the pins at the bottom half to get the top half to lie down smoothly. 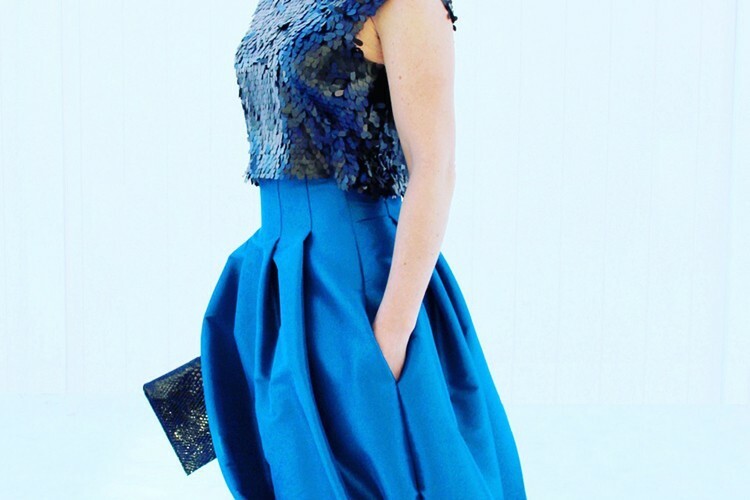 Note the two shoulder seam points and the top of the side seam. We’ll create those lines with a ruler in a moment. 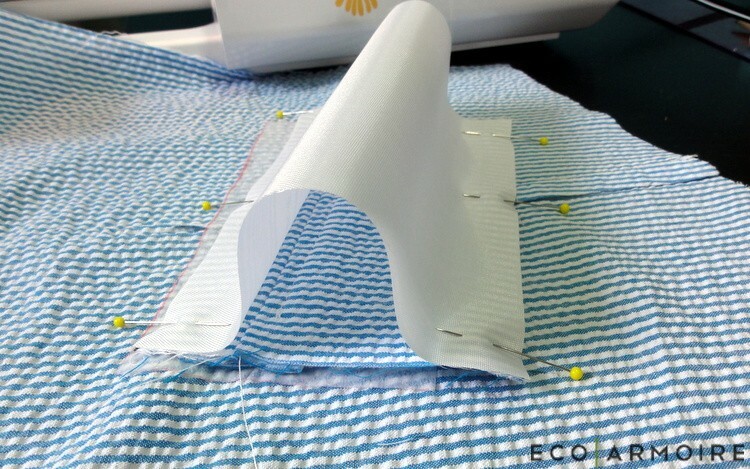 With your garment moved aside, use a straight edge to connect the dots for the shoulder seam; repeat for the side seam. 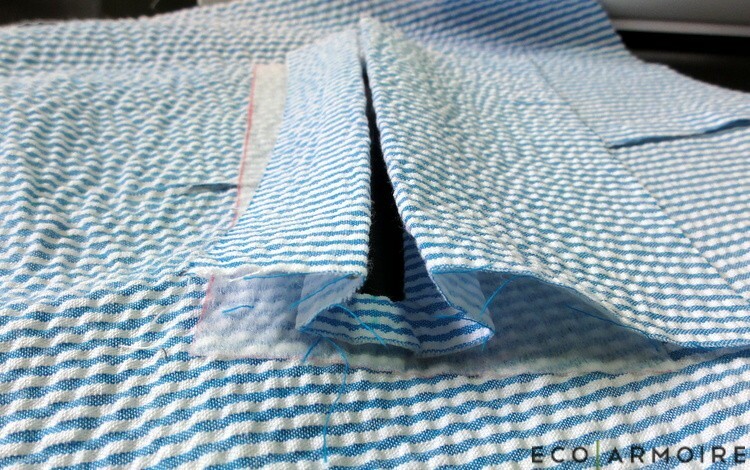 Then add 1/2 inch seam allowances all around. Place a punchhole mark for your dart, 1/2″ down from the sewn dart tip. Circle your button marks. Create an additional squared off line to begin working on the back. 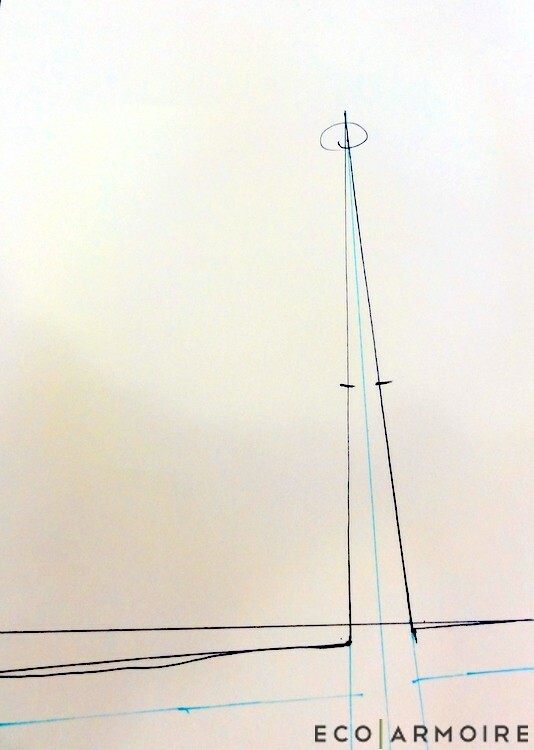 Find your center back line and align it with your vertical line, placing the hem point at the horizontal line. 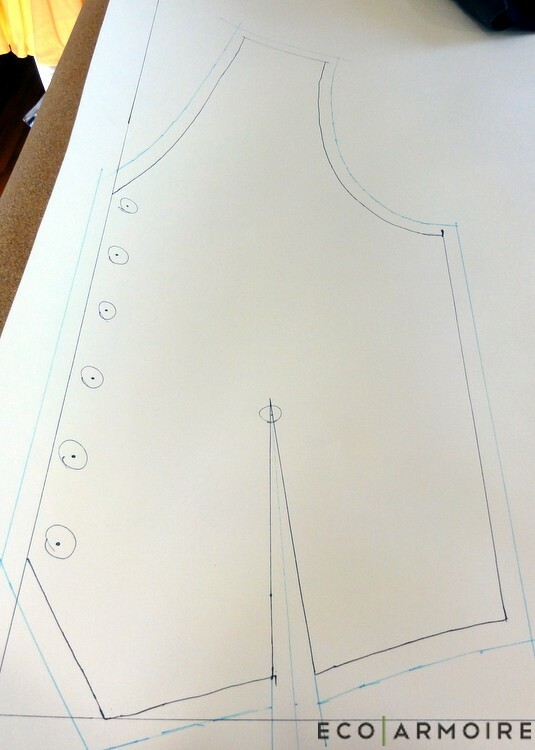 Flatten out the bottom and draw your hemline up until the dart. Repeat the dart steps as mentioned above. 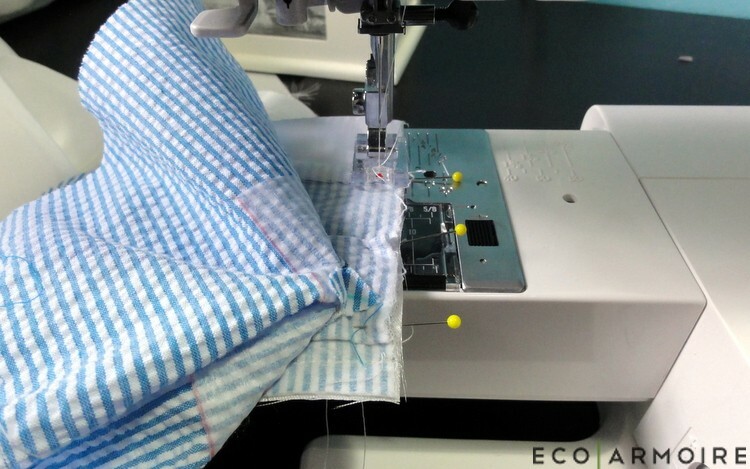 Trace off the remainder of the hem towards the side seam. 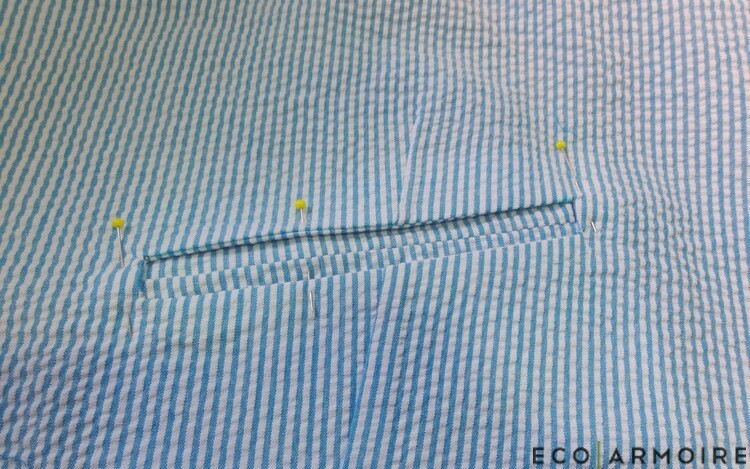 Note how my tracing at the hem line wasn’t smooth. I took a hip curve and created a smooth line. 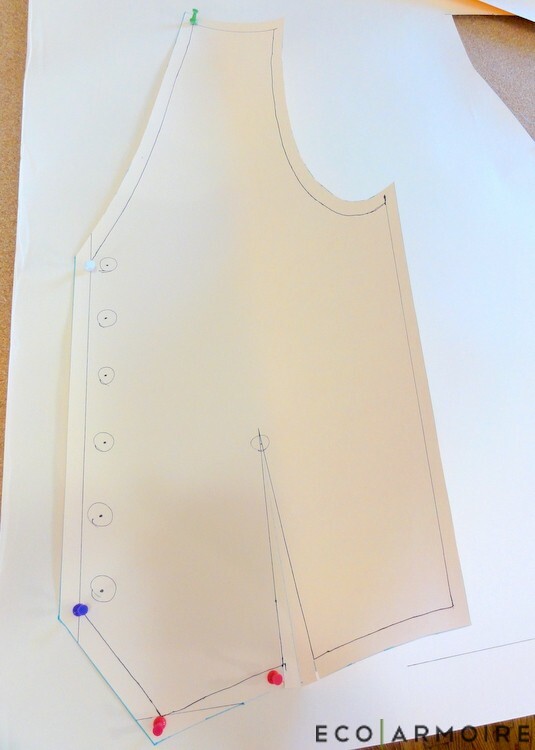 Repeat the steps for the armhole and neckhole and add your seam allowances. 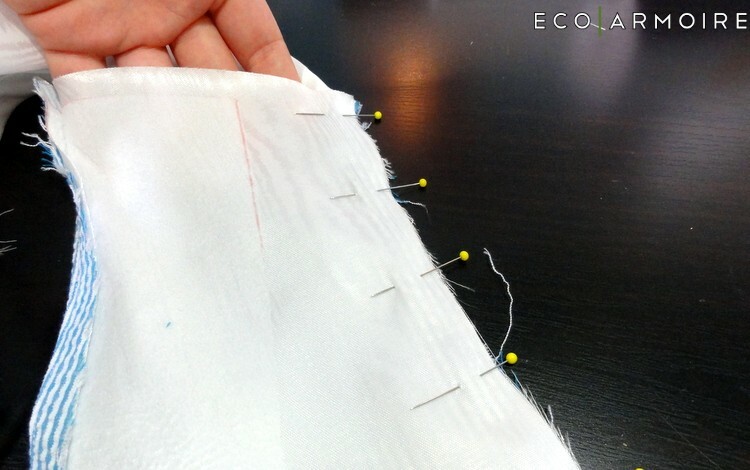 Use 1/2 inch on side seam, shoulder seam and hem. 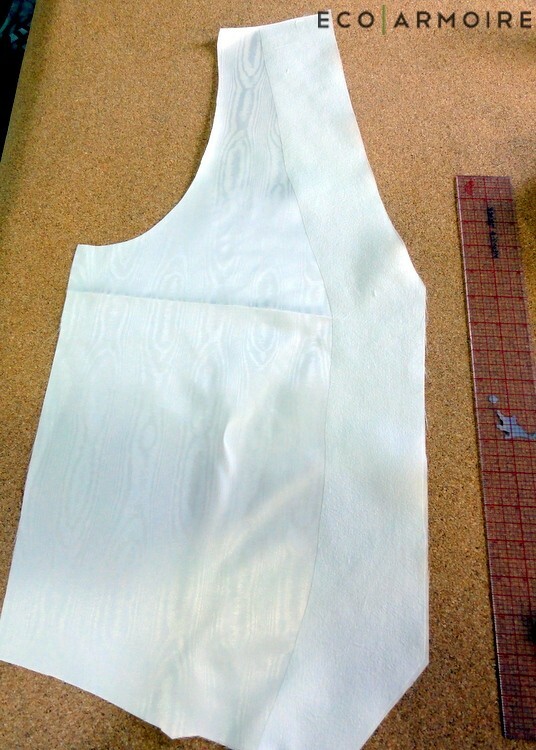 Use 1/4 in seam allowance on the arm and neckholes, since we’re going to be using binding to finish the edges. Pin the front piece down on a new piece of pattern paper. 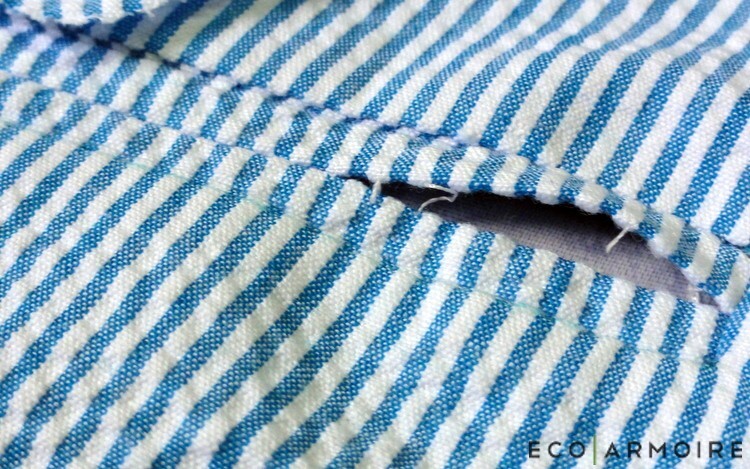 Trace 2 inches of shoulder seam, down the neckline and front seam, all the way around to 2 inches into the bottom hem. 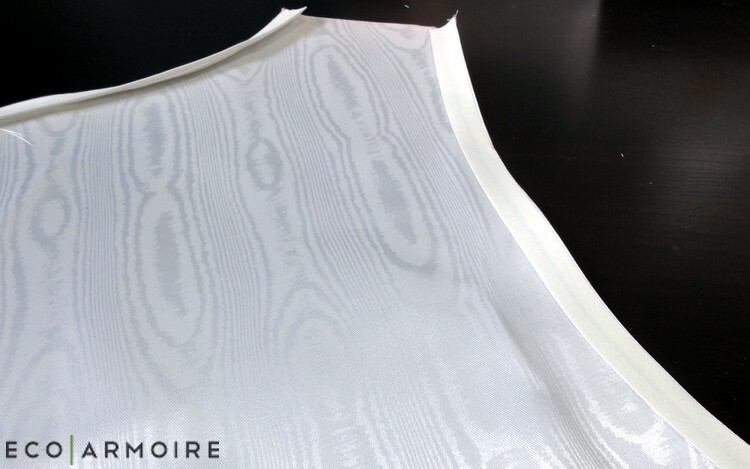 This will create our fusing pieces to stabilize the lining and reinforce the button area. Mark lines 2″ away from all the traced lines. Use the curve to smooth those lines. Draw a line all the way around about 1/8 inch inside the pattern piece. This will make the fusing piece slight smaller than the area it will be fused to, so that no fusing gets onto your iron. 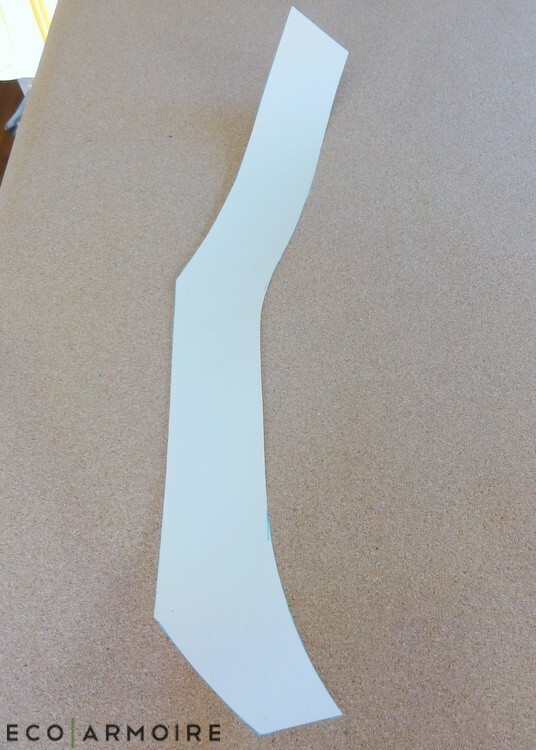 Here’s what the piece will look like after you cut it out. 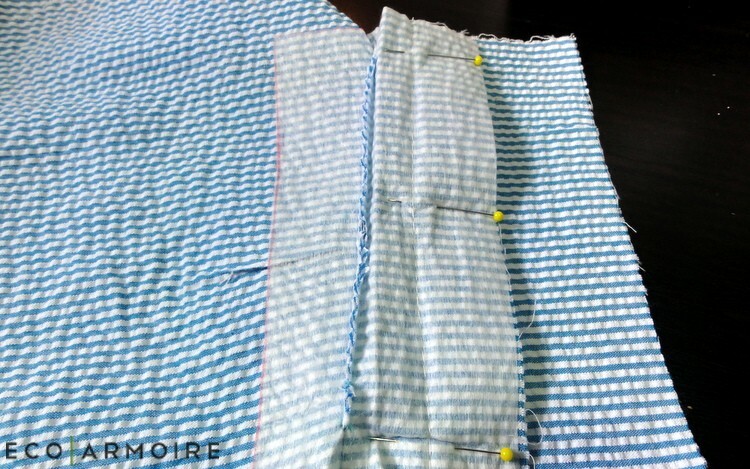 Fuse your long piece to the wrong side of your lining. I’ll show you how to fuse the other pieces in a later step. 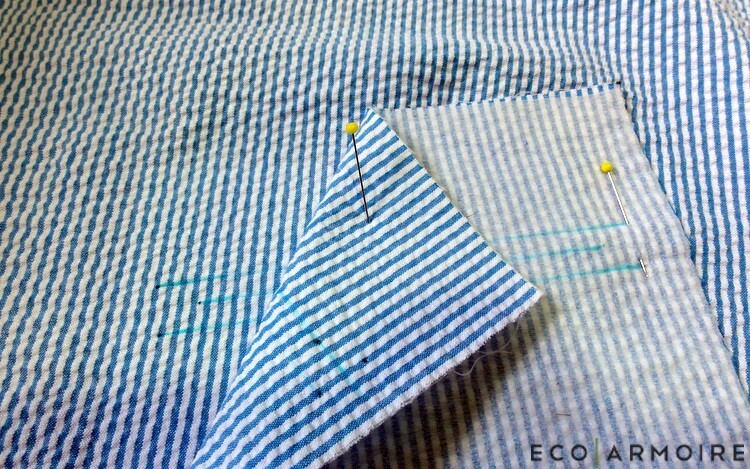 Pin your single fold bias to the right side of the back lining fabric at the armhole and neckhole. Stitch bias on with 1/4 inch seam allowance. 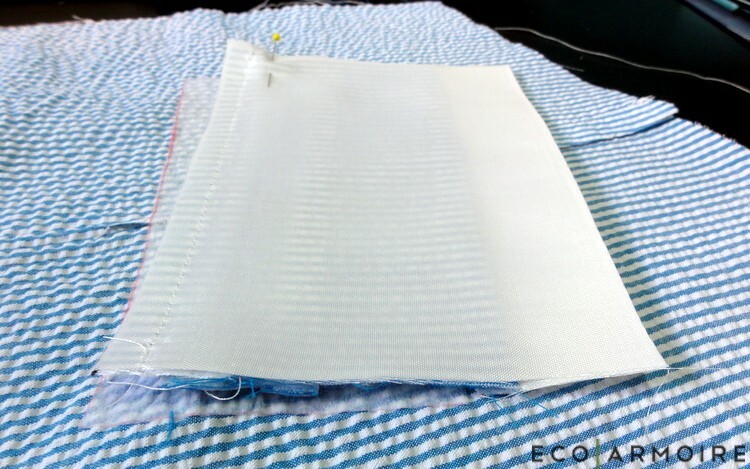 Press the bias tape towards the back and then, fold it over so that all of the bias tape is now on the wrong side. Unlike double-fold, this bias tape will all be hidden inside the garment, as opposed to double-fold which hugs the opening like a taco. 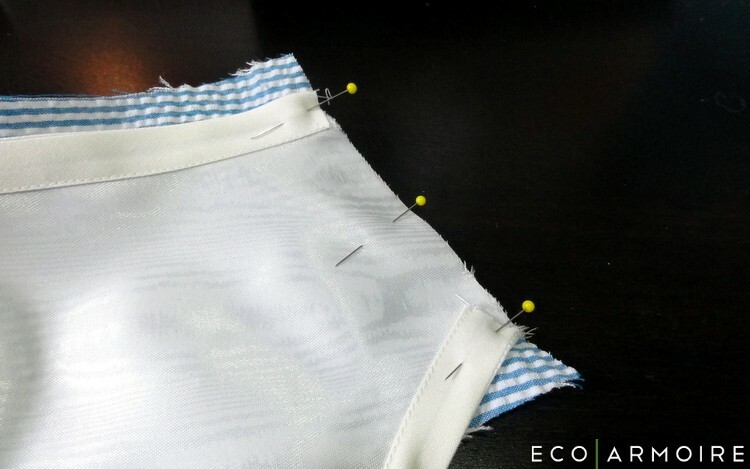 Pin your folded and ironed bias tape in place and stitch it down, keeping your stitches lined up with the edge of the bias tape. Go slowly here as stitches like to skip off the bias tape. Turn the hem, 1/4 inch twice and iron and pin in place. Top stitch the hem. 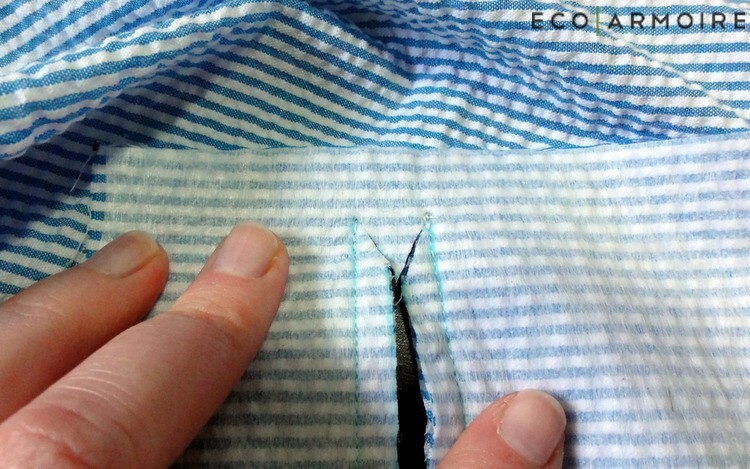 Side and shoulder seams should still be raw. 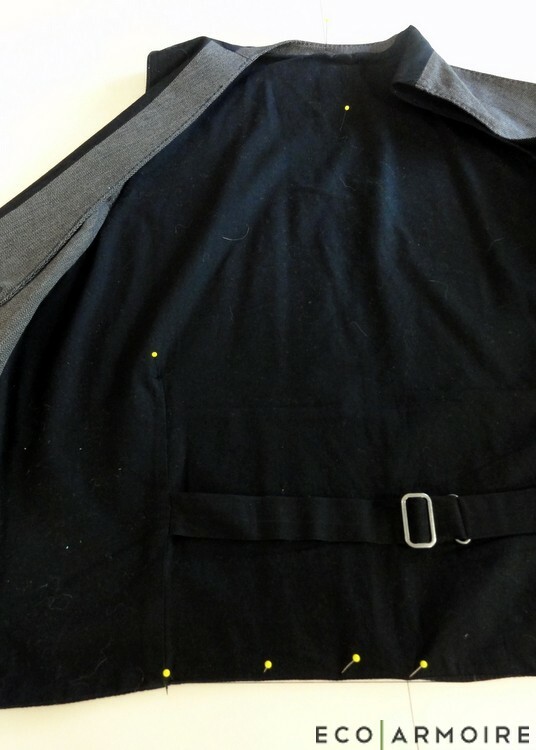 Now the fun part: welt pockets! Download this welt pocket pattern. This is for a 5 inch pocket. Poke holes in the 3 points of each triangle in the corner. Pick your pocket placement (Mine is at an angle over part of the dart.) 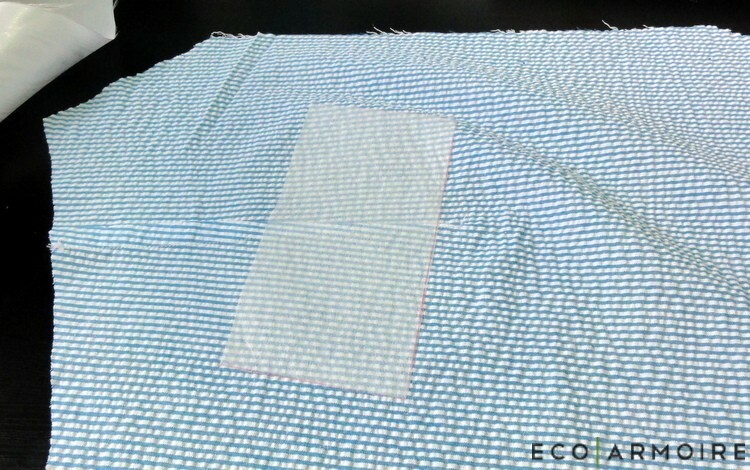 and mark your 6 points on the right side of the fabric through the pattern with a water soluble pen. Connect all the lines with a ruler, to look just like the shape on the pattern. 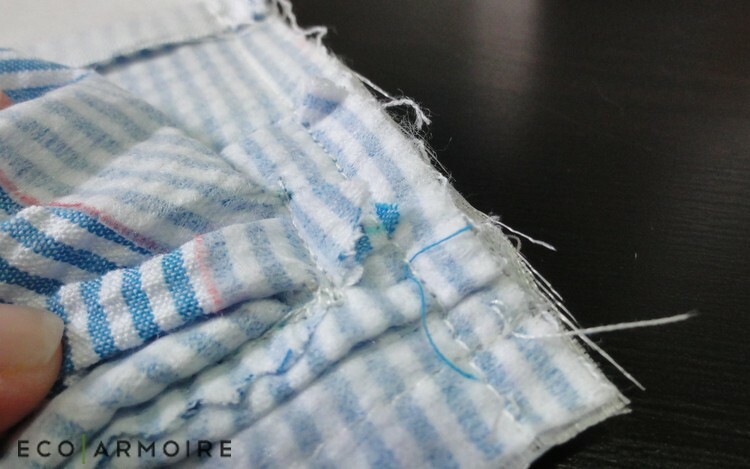 On the wrong side of the fabric, fuse one of your 3 x 6 inch pieces over the area that has the pocket markings. 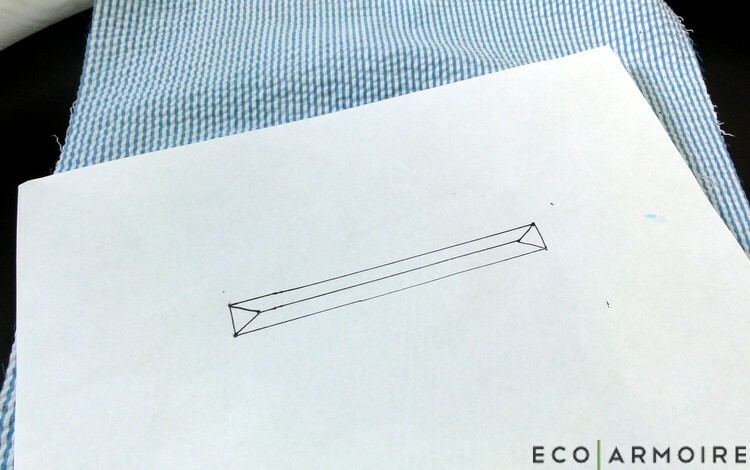 Draw a horizontal line 2 inches down across your 6 inch square. Fuse the other piece underneath this line. 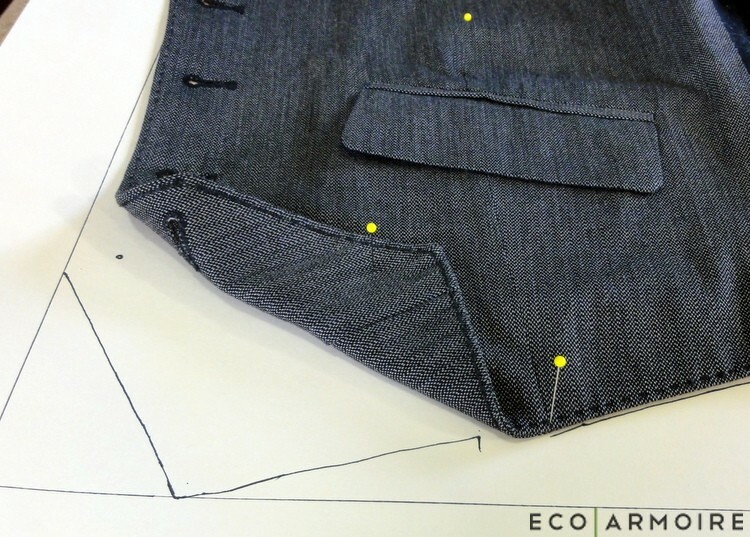 Draw your welt pocket pattern with this line as the center line. Align your 6 inch square on top of the front piece with right sides together. 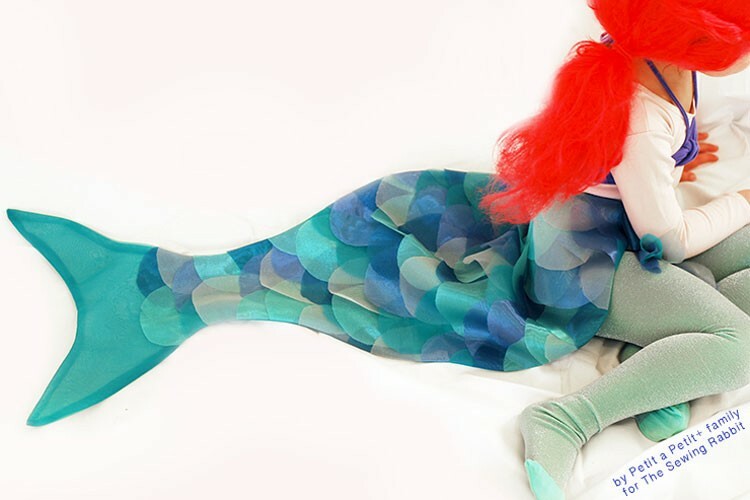 Stitch along the outer lines only, starting precisely on the beginning of the line and ending precisely where it ends. This is what it will look like when it’s stitched up. Cut down the center line, also stopping at the end, before you hit the triangle. 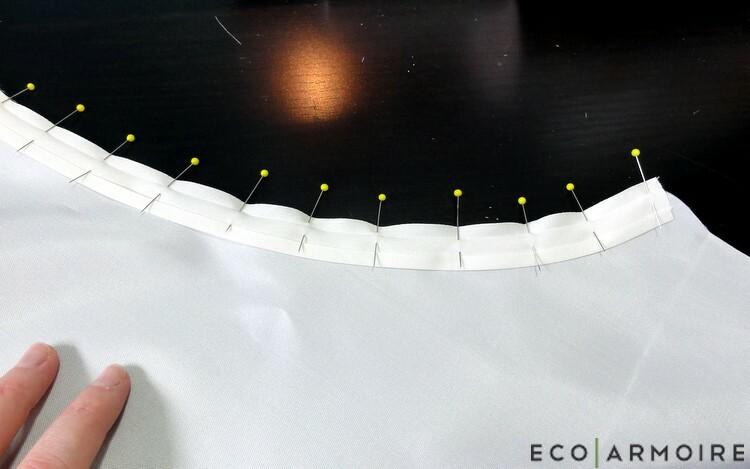 Cut slits down the triangle sides towards the ends of your sewn lines. DO NOT CUT the triangle piece off. Turn the underwelt piece (6 inch square) inside out to where it is no all on the inside of the front piece. Iron it down. 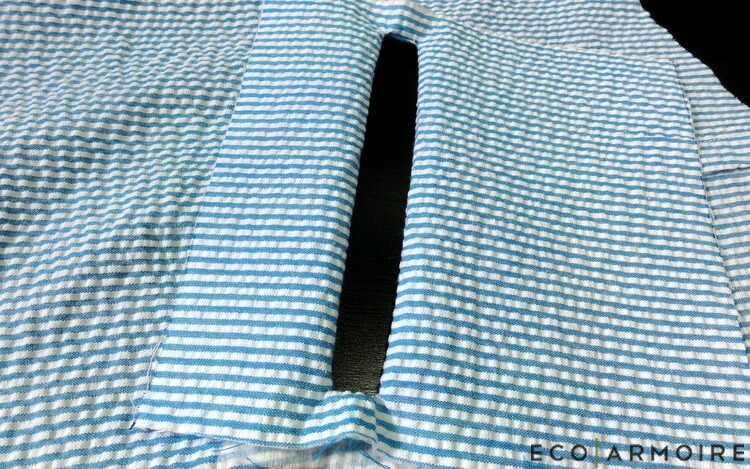 Fold the ends of the underwelt towards each other, pleating the pieces to where they meet in the middle, aligning the fold lines centered in the pocket hole opening. Iron down. 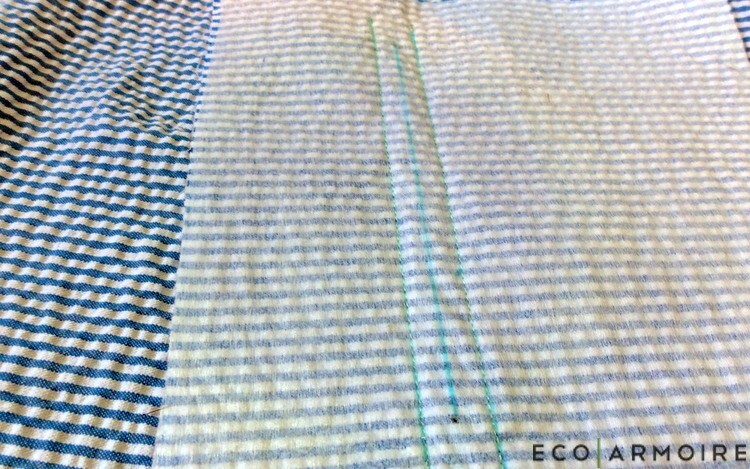 Stitch down the crease line, using a long basting stitch. 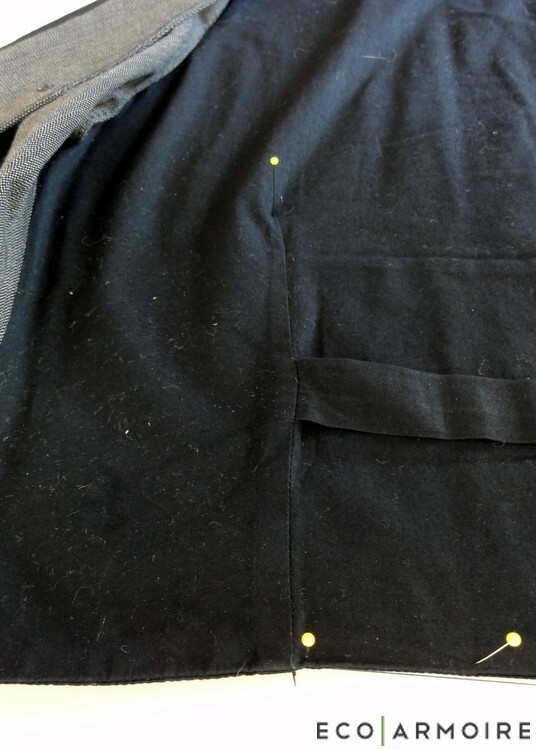 Pin the underwelt in place to where the seam of the underwelt is centered in the welt pocket hole. 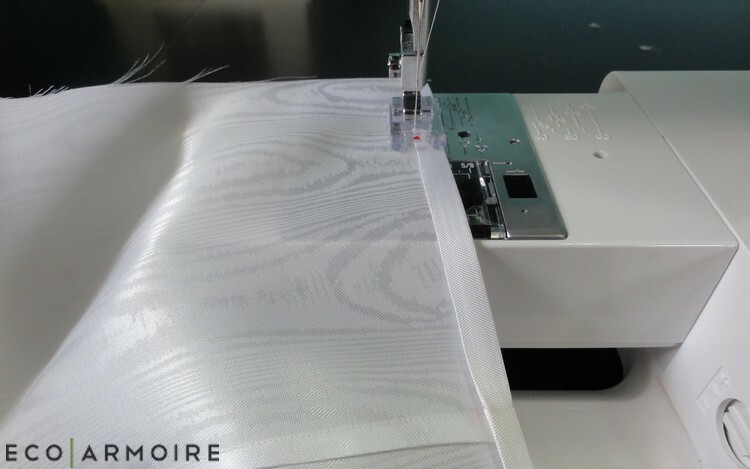 Opening the underwelt and exposing the original seam, stitch along your original lines to attach the pleated underwelt piece to the main fabric piece. 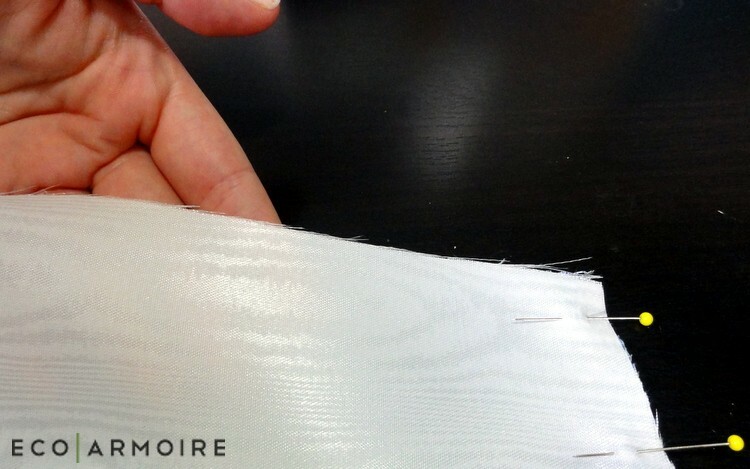 Take the lining piece and pin it to the top and bottom edges of the underwelt. Stitch the underwelt piece and lining together using a 1/4 inch seam. There will be a bubble which will get smoothed. 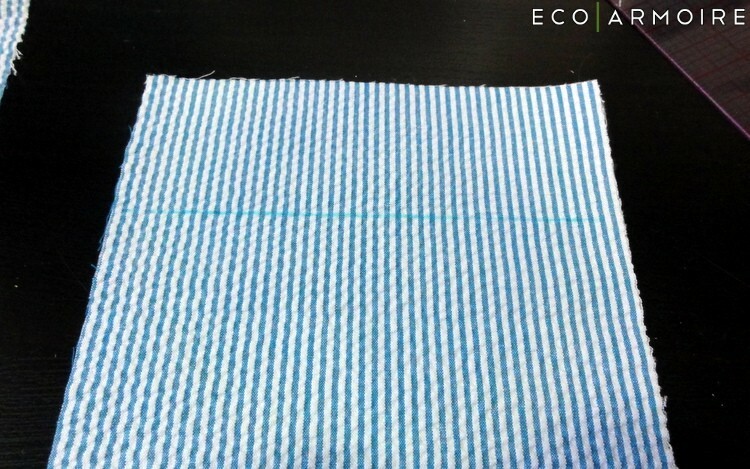 Fold the excess towards the bottom and then iron it flat. Pin the sides of the pocket bag together. Stitch side seams up using 1/4 inch seam. Stitch down the final sides of the pocket opening. This is the short side of the long rectangle that made up the welt pocket hole. 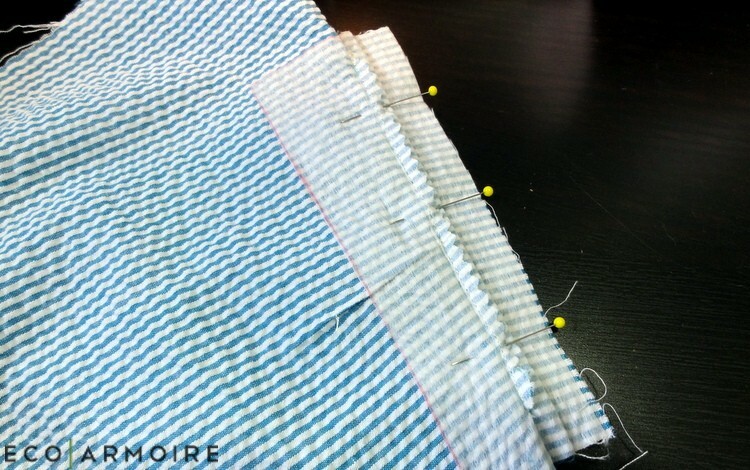 On the front side, using seam ripper, remove the basting stitch you used to hold the welt pieces together. Pin together front piece to back piece, right sides together, at the shoulder seam. Offset the back piece 1/2 inch on either side since we’ve already bound those seams. Stitch 1/2 inch seam. 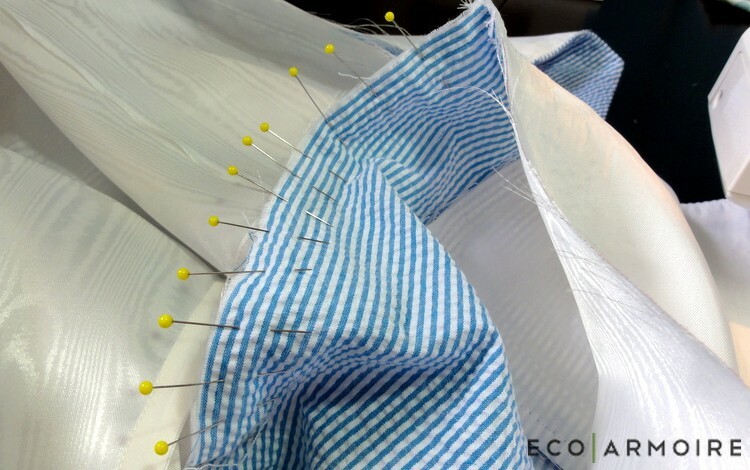 Pin down the front piece and the front lining at the neck and center front and stitch 1/2 inch seam, pivoting with the needle down at the corners. Open the pieces and understitch the neckline and down the center front. You won’t be able to get all the way into the corner so just go as far as you can. 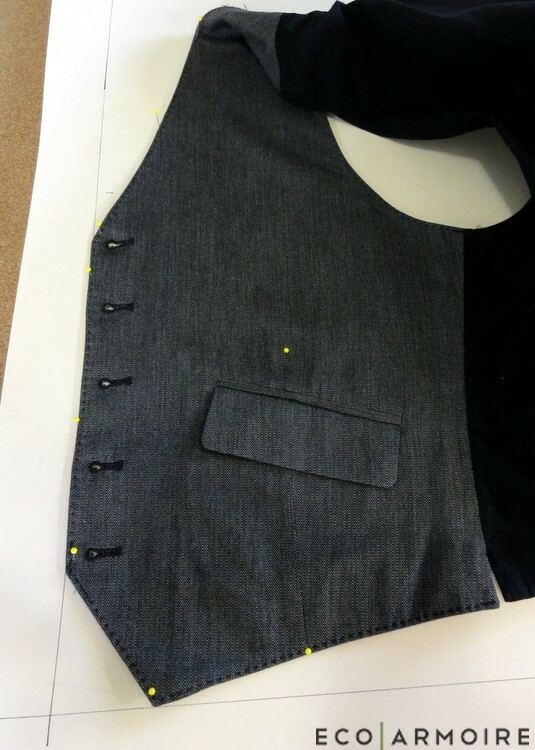 Pin together self fabric and lining at the armhole seam, leaving the shoulder seam open. Clip your armhole curve. Understitch starting at the side seam going as far as you can up the armhole seam. 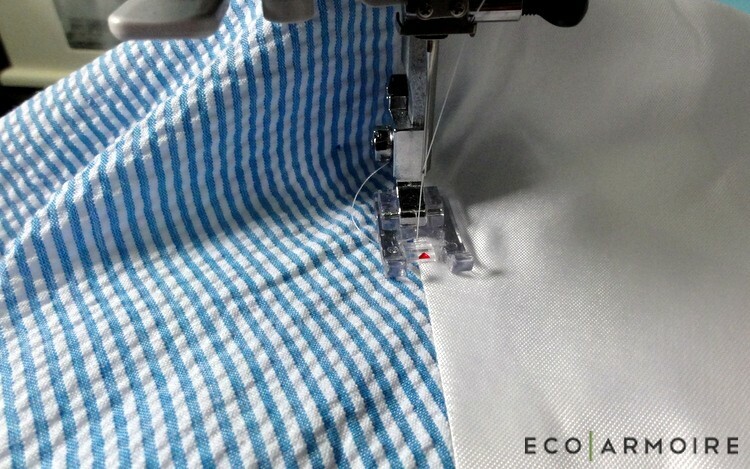 Repeat on the bottom hem, leaving the side seam open. 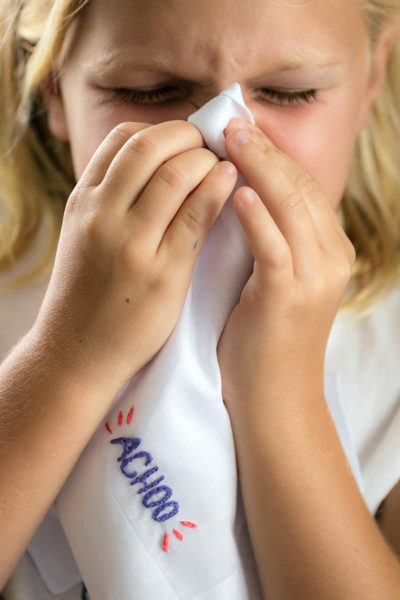 Stitch, then iron, and understitch. 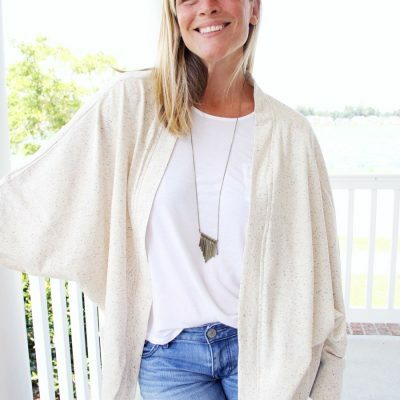 Pull the front right side out through the opening at the top of the shoulder seam. Pin together the front self fabric to the back lining, right sides together. Stitch 1/2 seam. 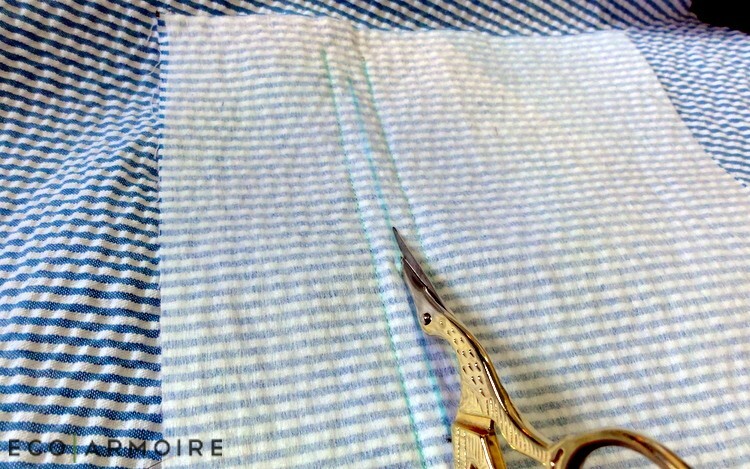 Start right where the lining meets the self on the front piece and end at the same point at the bottom. 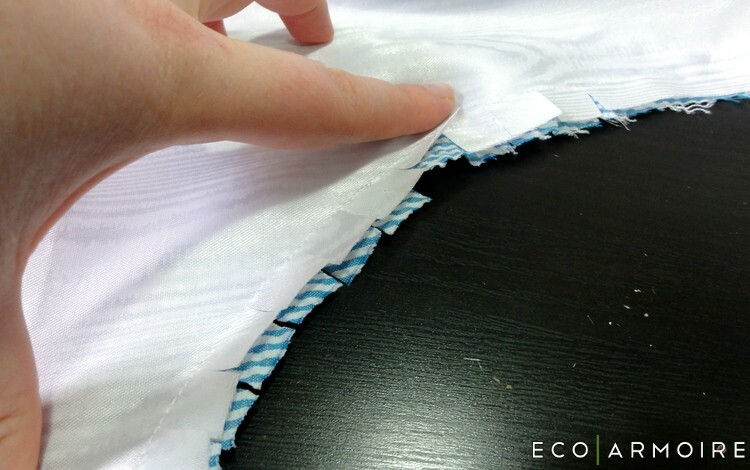 Fold back the seam allowance into the lining, pin and place. 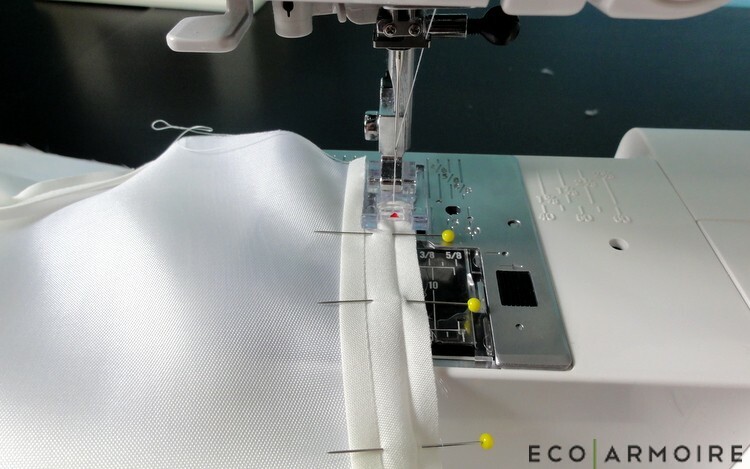 Do the same for the shoulder seam. 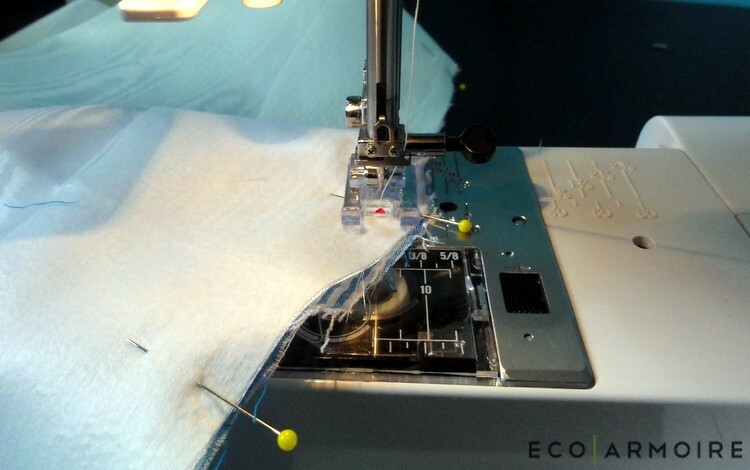 Secure the side seam and shoulder seam by topstitching from the front side. 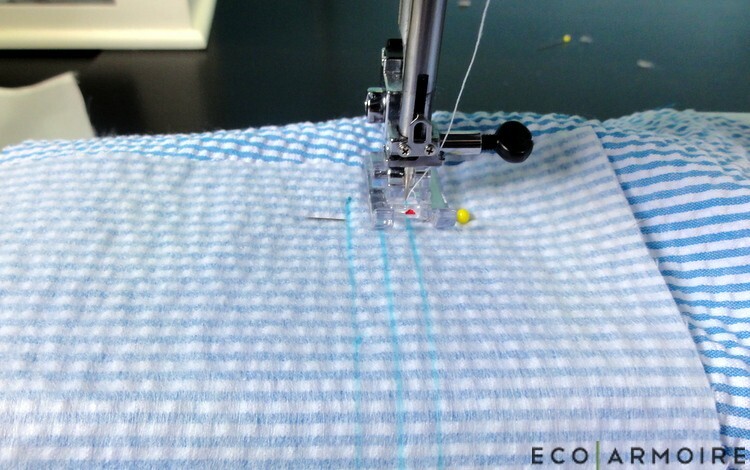 Follow the instructions for your machine to sew in buttonholes. Kris has requested another one already and after a few tweeks, I think we can get the fit even better. Not bad for my first attempt at menswear. have a question: if you guy has a big belly would you eliminate the darts. I just rented some vests for large actors for a stage show, and they don’t have darts. FWIW.